It sounds like a match made in heaven. One of Hollywood’s most respected directors, Martin Scorsese, teams up with one of Hollywood’s favorite leading men, Leonardo DiCaprio, to make a thriller based on a best-selling novel. 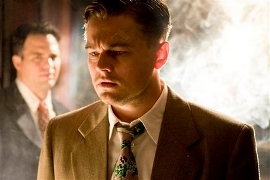 So why hasn’t Shutter Island gotten more acclaim? The movie Shutter Island is about the mysterious disappearance of a murderess from an island prison for the criminally insane. Ella recently saw the film. Find out if it lived up to her expectations. Jeff: So Ella, what do you think of that new Scorsese movie? Ella: I am so disappointed. I love horror movies, thriller flicks. But Shutter Island, it was just a huge disappointment. It was so predictable and it was just like “Oh, they’re on an island, they’re in a fortress, it’s all locked down, something scary is gonna happen!” But nothing scary happened. It was…I was just so disappointed, compared to his movies in the past. Have you seen his other movies before? Jeff: Yeah, I’ve seen…I was just thinking about Taxi Driver earlier today. I really like that one. I feel like a lot of his earlier stuff I’m in favor of, like I don’t think the newer stuff measures up. Ella: I think he’s losing his mind. Jeff: Yeah, an Oscar for The Departed? I disagree. Ella: I never saw that, so I can’t say anything about that yet. Jeff: Well, I’ll go ahead and let you decide for yourself, but that wasn’t my favorite. Ella: So, how do you think he’s evolved, you know, compared to his older movies, to now? Jeff: I think that’s the problem. He hasn’t evolved. His new ones are a little too formulaic. Jeff: And he’s kinda been pulling the same punches for years. Ella loves horror movies and thrillers, so she was excited to see Shutter Island, which looks scary. But Ella didn’t think the movie was scary at all. She was disappointed by the film. Martin Scorsese directed Shutter Island. Jeff is a fan of some of Scorsese’s earlier films, like Taxi Driver, Raging Bull, and Goodfellas. But he has been less impressed by Scorsese’s more recent work. He thinks Scorsese’s movies have become too formulaic and predictable. Scorsese hasn’t learned to pull any new punches. Who is your favorite movie director? Are you someone who is predictable, or do you like to try new things? Hi,i wish to be your friend.If care,write me on ( ) so that we can communicate conveniently. last year I seen both movies of Leonardo first one was shutter Island and 2nd was Inception. He performed so well in both. But the ends were confusing in both. genuinely I like to watch romantic movies but its so long after Titanic. there was no one like that in last few years. favorite director is James Cameron. I really don't have a favorite director since I watch the movies because the stories. Anyway, I like the Fernando Meireles' movies. I like to try new things, but I'm not all against the old ones. I’ve watched it today for once，but i think i need to run it over again to fully understand it. There are so many clues,and plots entangled together,to sort out,otherwise wathers would miss the excellency of this weightful flick. You’ll be surprised by its seemingly doomed yet not end. The hero doesn’t actually turn isane, it’s all plotted, not as formulaic as the former similar horror flicks. Do you notice the last words the partner calls ? I disagree. I have seen the movie and liked it, it was enjoyable. It is not a horror movie but with lots of thrilling details, the music is outstanding. By the way about how this movie ends: there are still two opinions about it. So, it is up to you what to bealive how your imagination works. I will definitely give it the second shot. DiCaprio looks funny, He needs some work out to tight up his middleage belly although he still looks like a teenager on his face. But despite of all – the way he works is great. I have'nt seen this flick. I love Tim's Burton films and so Jhonny Deep, And I believe they are match made in heaven.! I haven't seen this film. I have got favourite films, actors but I don't have any movie directors. I'm fond of trying new things.